Well known illustrator and artist born in Highbury London the son of an artist Clive Upton. Because there was another artist Clive Upton he added another ‘T’ to his name to distinguish. He had fame during the second war as a polictical cartoonist working newspapers such as the Daily Sketch and Sunday Graphic. In addition he had considerable fame for his posters. Illustrated many books including the Look and Learn series. 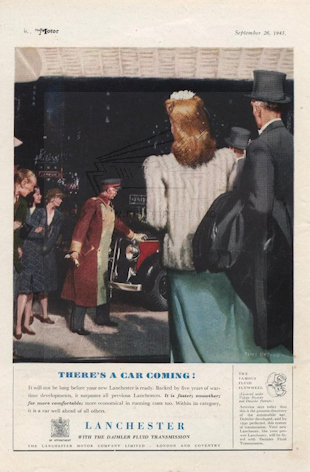 Little indication of motoring work other than advertisements for Lanchester in 1946.